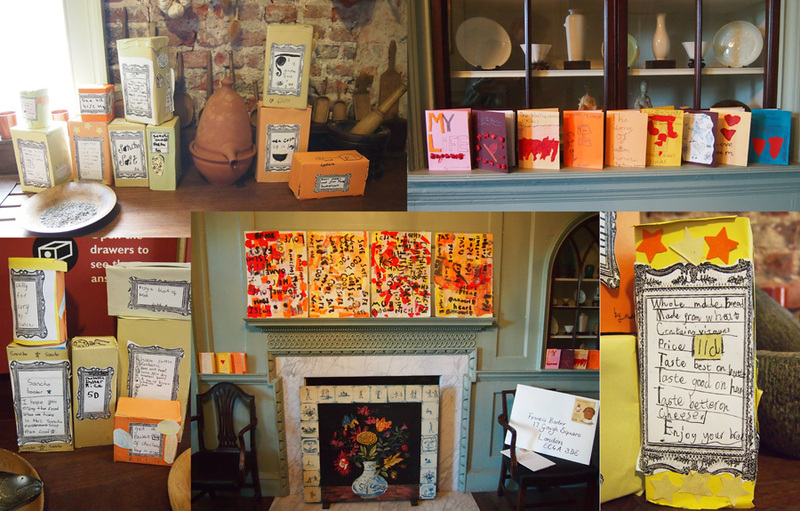 The exhibition I have been creating with local Hackney Primary Schools at National Trust property Sutton House, inspired by Influential Black Londoners, is continuing to grow week by week – it’s a fantastic place to display children’s work, so much more interesting than a gallery. Last week we focused on Ignatius Sancho, and transformed the Tudor Kitchen into a grocery shop. Each child created their own product and made some original packaging for it, complete with some marketing information – I like ‘Have some fantastic peas and sweet corn, also dry beautiful beans’ and ‘These peas taste amazing, they are the best in the world’ as well as ‘Enjoy a block of bread’. This week’s class also made a library of miniature books – my favourite is Francis Barber’s Christmas, where he is given a large parcel by Samuel Johnson. What was inside? A lovely dictionary! The exhibition will continue to grow week by week until the end of November. This entry was posted in collage, General news, Workshops on October 24, 2013 by Jane Porter.